Almost any function can be rewritten as an infinite sum of similar simple terms. In your study of series, you'll learn how to form them, and why they're useful. For example: When you calculate a sine or cosine on your calculator or a computer, the machine doesn't look the value up in a table or draw a unit circle or a right triangle; it does it using a series representation of the function. Functions like sine, cosine, the natural exponential function f(x) = ex and many others can be expressed as an infinite series of terms of various patterns. In mathematics, a sequence is just a string of numbers, like 1, 2, 3, ... or 3, 6, 9, 12, ... A series is the sum of all the terms of a sequence, like the examples above. Now these series are, of course, just approximations of sin(x), cos(x) and ex, but the thing is, by adding more terms in the predictable sequence of terms, we can make them as precise as we'd like. In fact, series like these are how your calculator actually calculates sines, cosines and other functions. In mathematics, a series is a sum of many (perhaps an infinite) number of terms. The terms of a series generally follow a predictable sequence that can usually be expressed in the shorthand of summation notation. In the table below, the first five terms of the series representations (above) of sin(45˚), cos(45˚) and e1 = e are calculated, summed and compared to the actual value (from a calculator). Notice (↑) that after adding just five terms of the series the sine and cosine sums end up very close to the actual values we'd get by using a calculator. 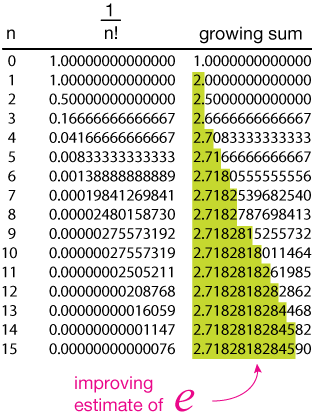 The yellow highlights mark the error in the approximation. We say that these series "converge rapidly to the value of the function." The exponential function converges less rapidly — it would take several more terms to reach the precision of our sine and cosine — but it eventually does. You might want to make a similar table on a spreadsheet to show that this is true. (Yeah, I know you won't, but being able to do things like that is a terrifically useful skill). 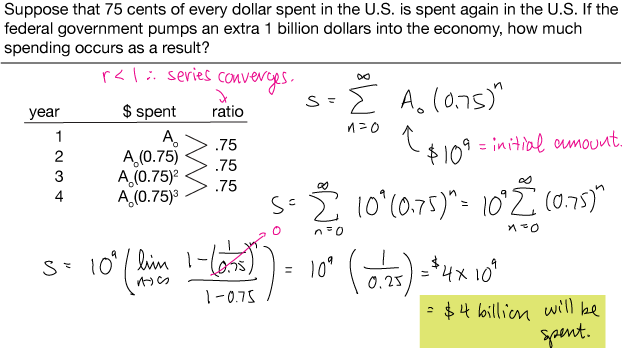 Your calculator and computers use series approximations like these to calculate sines, cosines, logs and their inverses, and other functions. It's more efficient than storing a table of values, and it makes use of the "native" operations, addition, multiplication, &c.
In your later work in mathematics, you will probably encounter functions that are too cumbersome to work with or even impossible to solve, but that are much easier to use and understand when expressed as a series. Just how we find these series representations is a topic for later. For now just take it for granted that they (usually) exist. Before embarking on our discussion of series, we have to get used to (or get reacquainted with) summation notation. We use the capital Greek letter sigma, Σ, to indicate a sum of terms that have a similar pattern. To the right of the sigma is a model term (xi in both sums on the right). The variable i is an index or counting variable. We generally use i, j, k, l, m & n to stand for integer counting variables. Under the Σ, we write the starting value of i. It starts at 1 in the upper series and zero in the lower. Above the Σ, we write the final value of i, 10 in the upper series and infinity in the lower; the lower series has an infinite number of terms and the upper series only has 10 terms. The variable i may be involved in the term model in a variety of ways. 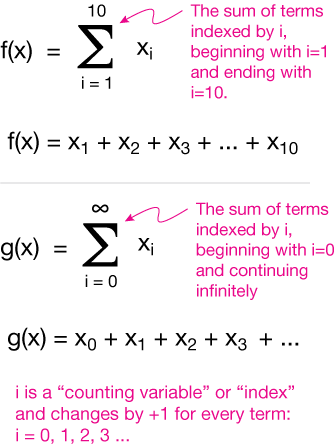 Here are some examples of short (finite) series represented in summation notation. You should make sure you understand how each represents the terms of the series. Take a minute to convince yourself that this is true. Consider the story of Zeno and Achilles: The two have an argument and Achilles tells Zeno he's going to have to kill him – shoot him with an arrow. But Zeno says "Go ahead, you won't kill me!" Achilles: "But that's ridiculous, I've shot and killed many men with my bow, and I'll kill you, too!" Zeno: "No, my fine, hulking friend, your arrow will never reach me!" Zeno explains that when Achilles releases his arrow, they would have to agree that it will take a certain amount of time, let's call it t1, to travel half the distance to its target. Afterward it will take another, smaller but still finite, time, t2, to travel half of the remaining distance. It will take a time t3 (smaller still, but measurable!) to travel half of the remaining distance, and so on, infinitely. Now, Zeno argues, if we add an infinite number of finite times, even though some are quite small, we end up with an infinite time - the arrow will never reach me! Achilles fires his arrow and kills poor Zeno dead as a doorknob. The series, each successive term (a time) half of the previous, converges to exactly the time it would take for an arrow to travel between Achilles and Zeno. A brilliant student of mine once noted that Achilles could just aim well behind Zeno and put the arrow through him on its way to the first halfway point. Some series converge to a finite limit, and some don't (they diverge). On the right are the first several terms of one of the series shown above, f(x) = ex, with x = 1. This series converges to the number e. Notice that successive terms only modify places further and further to the right of the decimal. That's what convergence means: The series approaches a finite limit as the number of terms grows. Some series don't converge at all. Thos sums just keep growing without bound. We call this divergence, the opposite of convergence. Convergent series are the most important kind. Series are usually used to find an alternate route to the value of a function that's difficult to find directly — we want convergence to some solution. We generally aren't too concerned with series that grow without bound. Why mess with series at all? Many times when we have to work with certain kinds of functions, the algebra is too cumbersome and we get nowhere. Re-expressing a function as a series of simpler terms can be very helpful. Often we don't need as much precision as a computer gives us. We can truncate (cut short) the series to give us just the limited precision we need. Sometimes the series representation of a function is much more enlightening at a glance than looking at the function itself. Often it's possible to say something about the shape of the graph in a certain region of its domain more easily by looking at the series. Often finding a derivative or an integral of a function is difficult or impossible, but can be done on the series representation of the function. This graph of the sum of the inverse squares of all of the integers was a challenging problem in mathematics for a long time until it was solved (in 1748) by Swedish mathemetician Leonhard Euler (pronounced Oy'-ler). It's called the Basel problem, named after Euler's home town. Euler showed that the sum of the series is π2/6, or about 1.645. The graph shows how the sum grows for the first 100 terms of the series. π2/6 is the upper bound of this series, and we say that the series converges to a limit of π2/6. Just how that limit is found is a subject for another section. For now, you should appreciate that a series converges to a finite limit (or approaches an upper or lower bound) if its terms decrease in size. At this point, it might be a little difficult to wrap your brain around the idea of a sum being finite when we're adding an infinite number of terms. It's a paradox and it's completely normal to be confused. Part of that confusion lies in our sloppy terminology. When we say "sum of a series" what we really mean is a least upper bound or a greatest lower bound, a number that the sum approaches but never quite reaches. 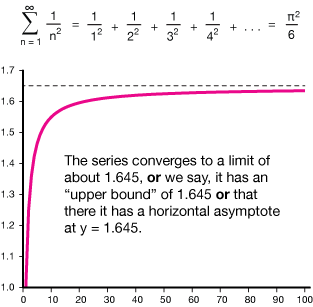 The sum of a series will never exceed its upper bound, and never be less than its lower bound. It's just that to the level of precision that we usually need, only a certain number of terms are really needed from any series to get us "close enough" to that boundary. Any additional terms would just further refine the number to higher precision. If Σ an converges, then the limit of the size of a term, an, is zero (lim an = 0). Then it must also be true that if lim an = 0, that Σ an diverges. Here are two simple kinds of series, and you can drill deeper into series at the end of this section. Consider the infinite series below, written as a partial sum of terms and abbreviated in summation notation. The series is an arithmetic (ar'· əth·met'·ick) series because there is a constant difference between successive terms. The constant difference is the hallmark of the arithmetic series. Note that this series could start just as well with n = 1, so there is some flexibility in this kind of notation. The notation isn't the series, it just captures what the series is in a kind of shorthand. Successive terms of an arithmetic series have a constant difference. The series s, above, diverges. It doesn't reach a some finite limit as we add more terms; the value of s grows and grows. In fact all arithmetic series diverge, except the trivial series with all terms equal to zero. You might think we could construct an arithmetic series with a negative constant difference to get it to converge, but that would just lead to a sum that grew infinitely in the negative direction. Nevertheless, arithmetic series, partiuclarly their partial sums are useful in certain circumstances. Take the first and last numbers, 1 and 100. They sum to 101. Now take the second and second-to-last, 2 + 49. They also sum to 101. And we have 3 + 48 = 101, 4 + 47 = 101, and so on, right down to 50 + 51 = 101. Gauss simply multiplied 101 by 50 to get the sum, 5050. You can try it with any range, as long as there's a constant difference between terms. It turns out that this is mathematically the same as finding the average of the first and last terms of the series, (1 + 100)/2 = 50.5, and multiplying this by the number of terms to be summed: 50.5 x 100 = 5050. 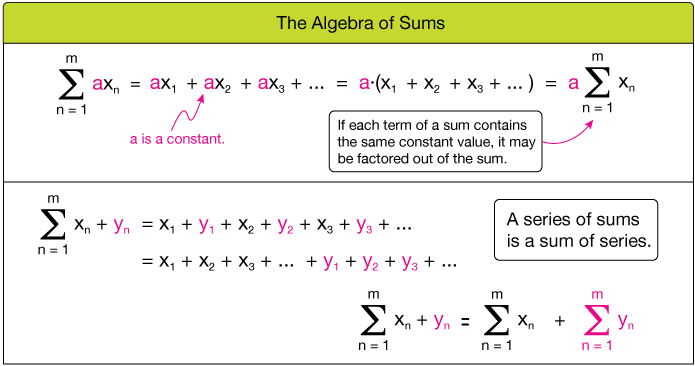 Before we go any further with series, let's review some algebra that might make some series operations easier. The relationships in the box below follow from the distributive property of multiplication and commutative property of addtion, respectively, and they'll help you to simplify the series with which you work. By the way, the plural of series is series. Just one of those things. 7. A falling object falls 4.9 m in the first second of freefall, another 14.7 m in the second, another 24.5 m in the third second and 34.3 in the fourth second. If this trend continues, use what you know about arithmetic series to calculate how far the object will fall (a) in total after 10 s, and (b) during the 10th second. 8. 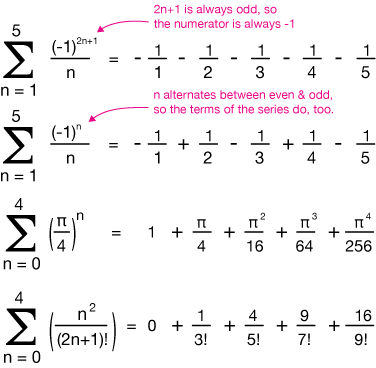 An arithmetic series begins with -10 and has a common difference of 1.5. Find the 50th term in this seres. The hallmark of a geometric series is that successive terms have a constant ratio instead of a constant difference. The ratio of any two successive terms in a geometric series is a constant number. Successive terms of a geometric series have a constant ratio. Each successive black section of the square above is a successive power of the constant ratio 1/2. You can see how rapidly the terms of the series become very small; this is a convergent sequence of terms and would form a convergent series — it would have an upper bound. Here is the algebraic representation of this geometric series. The first n terms of a geometric series can be represented by this sum, where a is a constant and r is the constant ratio. Counting from k = 0 to k = n-1 may seem a bit odd, but it is just for convenience in finding sums of geometric series later on. Looking at the examples of geometric series shown so far, it's not too difficult to see that if the constant ratio is less than one, then the successive terms of an infinite series will get smaller and the series will converge to a limit. If the constant ratio is one or more, the terms will either stay the same size or get larger, so the sum of the series will grow without bound. If r < 1, then the series will converge to a finite limit (upper or lower bound). If r ≥ 1, then the series will grow without bound (diverge). 11. 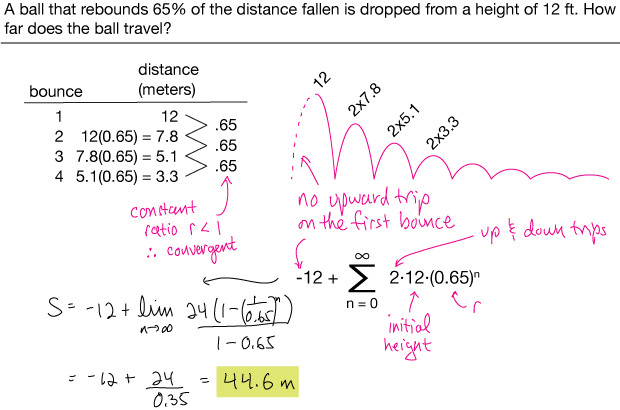 A ball that rebounds 65% of the distance fallen is dropped from a height of 12 ft. How far does the ball travel? 12. Suppose that 75 cents of every dollar spent in the U.S. is spent again in the U.S. If the federal government pumps an extra 1 billion dollars into the economy, how much spending occurs as a result? Here is a comparison of the growth of two infinite series, the first with terms of the form (½)n and the second with terms 1/n, where n ranges from 1 to 31. Only the growing sum is shown, not the individual terms. The first series converges and the second does not. But the series on the right doesn't have the same property. It is divergent (doesn't converge). The more terms we add to the series, the larger the sum will grow, even though the size of the terms clearly tends toward zero. If a series is to be used to represent some useful function, we must make sure it's a convergent series, otherwise it won't be of much use.